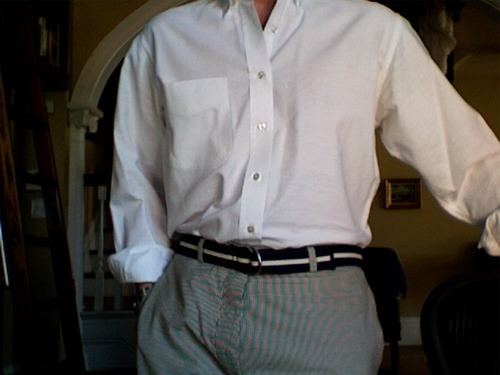 This entry was posted in Elegantology and tagged casual friday, clothing, summer. Bookmark the permalink. Love the sox. they’re great! White bucks have always make me swoon. Very nice indeed! I am jealous. Thank you all, I did this to illustrate that pattern mixing can work in many ways and make an outfit more interesting while still being very casual. Off the beach, this is about as casual as I get banning a pair of white bermuda shorts for cookouts during the extreme dog days, or gardening. Thank goodness for Oxyclean. Aesthete, I was a professional copywriter and if I had your chops…. Like to see -that you like to have good clean fun with mixing patterns. Oxyclean has replaced the hard to find BIZ here. Mrs. PvE, good stuff isn’t it? Is BIZ any better? I may be able to find that, too. And thank you, no… but I have a very good tailor and a flattering camera angle. At least now I can let that breath go…. Brilliant outfit. Very well done, ole chum. Thank you Antonio and LBT. 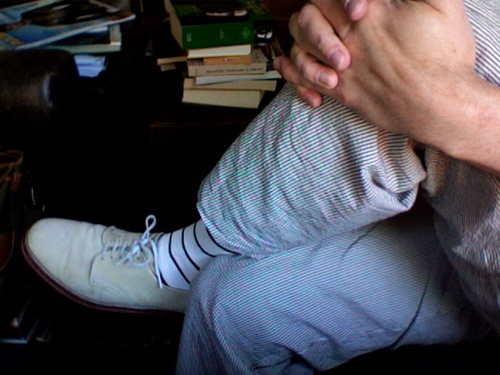 The only thing that’s changed since high school is the waist size and the addition of socks even though it’s over 60ºF.